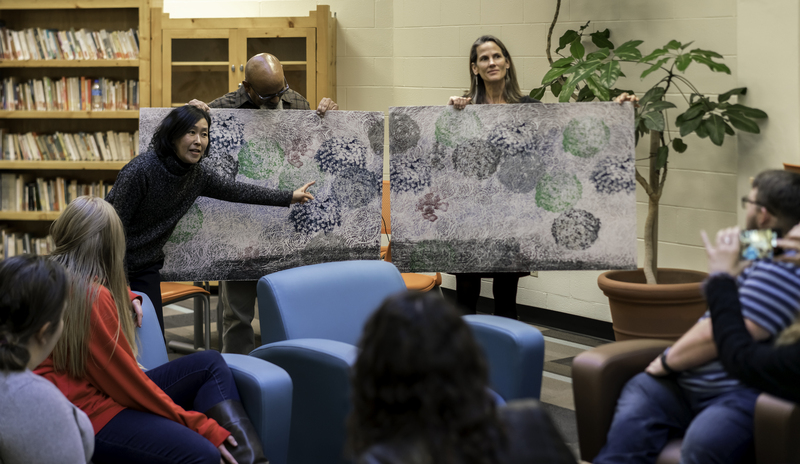 Print-maker Yoshiko Shimano (above) describes the process that she used in making the print that hangs in the World Languages Commons and in collaborating with poet Eleuterio Díaz (above) on a volume of prints and poems. The Department of Foreign Languages and Literatures is proud to be able to support the majority of our graduate students through Teaching Assistantships and Graduate Assistantships. Teaching Assistants are assigned responsibility of teaching one or two sections of a lower-division language course in French, German, Greek, or Latin. Grading Assistants are assigned the responsibility of assisting department faculty who are teaching large lecture courses. Teaching and Graduate Assistantship assignments include salary compensation, a fee waver for up to 6-credit hours per assignment, and health insurance. The Department of FLL tries to assign our graduate students two Assistantship assignment (= 50 FTE) each semester. Please see the UNM Graduate Studies webpage on Assistantships for the most up-to-date information on Assistantship salary and other benefits. For eligibility for TA/GA awards, please see the FLL Graduate Student Manual. In addition to TA and GA assignments, FLL is able to offer special funds for graduate study in French. Graduate students may apply for the Carol Raymond scholarship, a competitive scholarship which fully supports a graduate student for one semester of thesis or dissertation writing. On a competitive basis, the department provides partial support to qualified graduate students for travel to deliver conference papers. Graduate students at the University of New Mexico may also apply for University or external fellowships. Please see the UNM Graduate Studies website for a list of available fellowships. Contact: Graduate Studies, Humanities 107, (505) 277-2711. The Russell J. and Dorothy S. Bilinski Fellowship supports advanced doctoral students with a full-year’s funding during the fellow’s completion and defense of the dissertation. FLL doctoral students in French are encouraged to apply! The University administers National Direct/Perkins Loans and Federal Direct Student Loans and cooperates in the administration of a number of other such funds, as well as work study and student employment programs. Short-term emergency loans are also available to currently enrolled full-time graduate students. Contact: Student Financial Aid Office, Mesa Vista North, (505) 277-8900. The Student Research Allocations Committee provides money for student research projects and for travel expenses to conferences and workshops directly related to the student's degree program. Contact: SRAC, Graduate & Professional Student Association, Student Union Building (SUB), Room 1021, (505) 277-3803. Some funding for travel to conference may be available through the Dept. of FLL. The Department encourages graduate students to investigate outside sources of funding for study/research. Listings of grant opportunities are available through the Office of Research, 327 Scholes Hall, (505) 277-6128. A Teaching Assistantship is a financial award to a graduate student for part-time work in teaching or research while the student pursues study toward an advanced degree. Teaching Assistants earn a stipend and receive a tuition remission up to 12 credits per semester. Current information on TA salaries can be found on the OGS website here. During their first semester, first-year TAs at both the MA and PhD levels are required to take Foreign Languages and Literature 537 (Teaching Composition), a graded, three-credit practicum that counts towards the required pedagogy or professional studies hours of your degree program. After their first semester, TAs teach two sections per semester. The award of a Teaching Assistantship also includes graduate student health insurance. The Foreign Languages and Literature department encourages our graduate students at both MA and PhD levels to apply for teaching assistantships, and we consider the professional support and teaching opportunities we offer second-to-none. We have been charged by the university to improve student literacy by putting all undergraduates through a minimum of three writing courses at the 100 and 200 level, so there are many opportunities for graduate students to teach these classes. While the department’s first priority is to provide instructors for the many sections of freshman composition offered each semester, qualified TAs will also have the opportunity to teach more advanced courses in composition, technical and professional writing, creative writing, and literature. In most cases, Teaching Assistants will actually be the instructor of record for the courses he or she teaches, and they are responsible for all course planning, content, and grading. Some upper-division courses, however, do offer traditional Teaching Assistantship positions, with the responsibilities of the TA being determined by the professor leading the course. Teaching Assistants must be registered for 6 hours of graduate credit in both Fall and Spring semesters and 3 hours if they teach during the Summer term. In approximately 500 words, address your reasons, preparation, and objectives for teaching Foreign Languages and Literature courses at the college level. These letters should be well-developed and concise. You must include a relevant expository or argumentative writing sample of 10-15 pages, unless you have submitted such a writing sample for your admissions application. MFA applicants submitting poetry or fiction writing samples are the main target for this requirement. Submit two letters of recommendation addressing your potential as a teacher. If two of your three admissions recommendations address your potential as a TA, you do not have to submit additional letters. If your main recommendation letters are not directly applicable to a TAship, you should submit these two additional letters. The Foreign Languages and Literature department also offers several Graduate Assistantships, some with a course release, others with extra pay, and all offering the chance to gain valuable experience in research, administration, and teaching outside of the Core Writing program. The department’s standing GAships are listed below; each year other opportunities become available subject to funding and departmental need. In addition to the list below, GAships and readerships are often created to support the research and teaching of individual faculty, special projects, and departmental initiatives. Foreign Languages and Literature graduate students also often find GAships in other departments and programs such as CAPS, the Anderson School of Management, the Feminist Research Institute, Women Studies, the Health, Medicine and Human Values Program, and others. Students applying for Assistantships should be aware of the following policies. All policies and other information concerning Assistantships in Foreign Languages and Literature of all types can be found in the Graduate Handbook. By definition, assistantships are term appointments. Students should not assume that they will be reappointed merely because notification of termination at the end of the appointment period has not been received. Reappointments are contingent upon the continuing availability of funds, satisfactory performance of the assistantship recipient, relevant departmental policies and academic eligibility. The graduate unit will make notification of termination to the student and forward a copy of this notification to the Dean of Graduate Studies. In the case of students who are placed on academic probation, Graduate Studies will terminate the contract and notify the appropriate graduate unit and the student. The stipend for assignments that are terminated before the end of the appointment will be prorated for the period during which the assistant was employed. Assistantship recipients who suffer a serious medical condition requiring absence from assigned duties for two consecutive weeks may be granted, upon written request to the head of the graduate unit, a two-week sick leave without loss of stipend. After this leave, the student will be paid only for the time the assistantship responsibilities were fulfilled. The graduate unit must notify the Graduate Studies office whenever it grants an assistant a two-week sick leave, as well as the date that the assistant returns to his/her position. Individuals who are awarded a contract and receive payment from the University of New Mexico, but who do not attend or are absent without leave will be required to repay any stipend collected from UNM. Student who hold assistantships and are seeking direction for submitting a formal grievance related to the assistantship are referred to the section on Academic Freedom of Graduate, Teaching, Research and Special Assistants in the UNM Faculty Handbook. The Foreign Languages and Literature Department offers a number of awards annually to its graduate students. Students interested in applying for awards should begin the application process by carefully reading the award descriptions as these may contain specific information about the application process not listed below. Students may apply for more than one award and specify all the awards applied for in the letter of intent, but need only submit one application; the Scholarship Committee will consider your application for all possible awards. Additionally, a letter of recommendation must be sent from a recommender who is familiar with the student and his or her abilities as a writer and scholar. Whenever possible, this letter should come from a faculty member of the Foreign Languages and Literature Department at the University of New Mexico. Letters of recommendation should be saved electronically as a .PDF file and sent to Dylan Gauntt at grad@unm.edu. Note: No financial award will be given until the recipient provides proof, in the form of a thank you letter, of having sent an acknowledgement of gratitude to the donor.